316L stainless steel or powder coated mild steel. Option of 304L stainless steel. 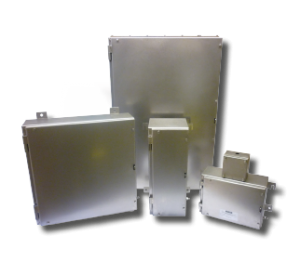 Available as empty enclosures (with component approval) or fitted with terminals (apparatus approval). Cage nuts fitted as standard, which alleviate the problem of stripped threads on fixing bolts. Padlock hasp door locking facility. CE-TEK also manufactures non-standard sizes across a wide range of materials. CEX enclosures are designed to meet the highest standards for equipment protection with ingress protection levels: IP66 as standard and, IP67, IP68 or IP69K as options. CEX enclosures are often specified by engineers and designers when their project or installation requires a robust enclosure that will withstand harsh environmental elements and temperature extremes, which affords minimal post installation intervention and maintenance. CEX enclosures were purposefully designed to meet these demands and can be found on oil and gas installations and other hazardous sites worldwide. CE-TEK’s flexible certification ATEX provides a wide scope for manufacturing various standard and non-standard size CEX enclosures up to 2000x2000x600mm. 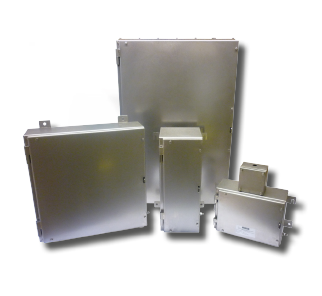 CEX enclosures are supplied either as empty boxes with ATEX component approval or populated with terminals with ATEX apparatus approval. A wide range of Ex terminals can be fitted to meet customer requirements whilst remaining within maximum heat dissipation levels as outlined in the ATEX directive. Available with ATEX 2014/34/EU Directive Ex e, Ex ia and Ex ib certification and a temperature classification of T5 or T6. CEX enclosures are available in special sizes and also as fire rated versions to BS5389-1: 2013 Sec 26.2e (970ºC for 2 hours), IEC331 (750ºC for 3 hours) or BS6387 CWZ (950ºC for 3 hours).